The lifestyle of Filipinos has truly evolved with the changing times. Given the fast-paced life, and endless opportunities in the Metro, we have been frequently “on-the-go.” We changed our work hours, our daily schedules, and even our meal time. But if there’s one thing that never changed throughout these advancements, it is the fact that Filipinos love their food. From eating in and preparing sumptuous feasts whenever there’s a chance, to mini get-togethers with friends, families and colleagues at work, we always find a reason to enjoy a hearty meal. As we all know, any signature meal would not be “Pinoy” if it’s not complete with the staple rice, flavorful viand, and a warm comforting soup dish. Because of this, the number one convenience store in the Philippines, 7-Eleven launches savory additions to its in-store menu line-up with the perfect combination of PRITO, KANIN, and everyone’s favorite - Knorr soup. Dubbed as the Pri-Ka-Knorr combo meals, Filipinos can now enjoy this complete option from 7-Eleven’s on-the-go selection. Pork Chop and Chicken Chop both sumptuously paired with Knorr Crab and Corn Soup, and Chicken Embutido with Knorr Nido Oriental Style Soup. With these super sarap combo meals, you can definitely experience a complete breakfast, lunch, or dinner that tastes just like home, even when you’re at work, in school, or anywhere on the go. There is no more reason for you to compromise a meal time when a delicious, complete meal is as accessible and affordable as this. Indeed, good food has never been more convenient to have. With over 1000 stores in Luzon, it is a must for you to rush to the nearest 7-Eleven and try the SOUPer Sarap Pri-Ka-Knorr Meals. Starting at just P89.00, you can already enjoy a full meal and even share it with a loved one. 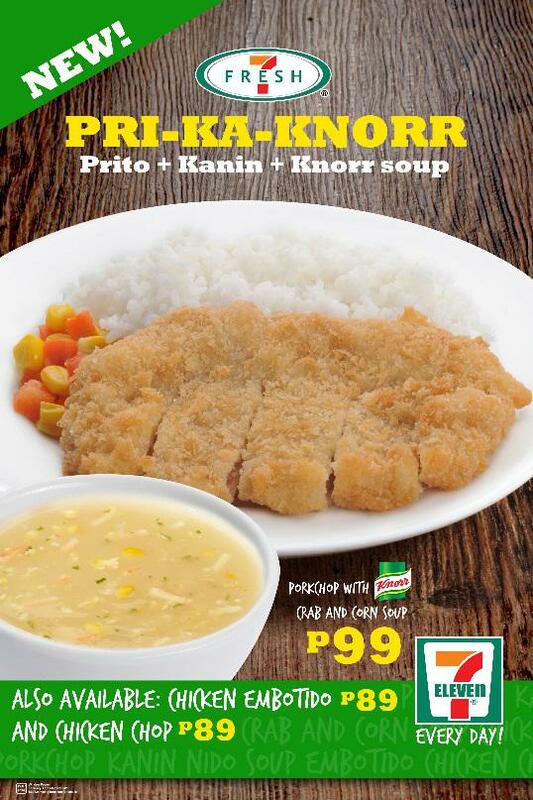 The SOUP-er Sarap Pri-Ka-Knorr meals are now available at 7-Eleven outlets. Enjoy your Pri-Ka-Knorr today!